FUJIFILM North America Corporation, Graphic Systems Division hosted another successful Packaging Technology Summit at its Chicago Technology Center, showcasing innovative packaging solutions to invited attendees. Industry professionals experienced hands-on demonstrations at the two-day event, highlighting the Graphium, a UV inkjet press for labels, packaging, and specialty print; along with learning more about the Flenex series, a new, innovative flexographic plate system, Fujifilm’s flexographic inks, and Flex Pack, a cost-effective packaging proofing system by CGS. There was considerable interest in the Graphium, a high-speed modular digital UV inkjet press with the option to integrate flexo and finishing stations for hybrid production and conversion in a single pass – greatly expanding the opportunities that can be converted. Graphium represents the next generation of UV inkjet press for labels, packaging and specialty print that enables profitable printing of short run jobs while boosting productivity and providing the ability to produce new print options previously unavailable through traditional flexo technologies. Graphium makes converting short to medium print jobs more profitable, as the press streamlines workflow, requires less setup material, reduces waste and eliminates overruns. Bob Moran, publisher of FLEXO Magazine, and a member of the Flexographic Technical Association, provided insights into the North American label market, and engaged in a lively Q&A with attendees. Todd Zimmerman, division president, FUJIFILM North America Corporation, Graphic Systems Division, educated attendees about Fujifilm’s innovations in the packaging industry. Attendees also showed keen interest in the Flenex plate-making system. The Flenex FW water-washable plate system is able to form flat-top dots, and reproduce 200 lpi with halftone dots from one percent to 99 percent. Additional advantages include very good ink transfer, superior compatibility with UV, water-based, and solvent inks; wear resistance and the ability to consistently maintain good product quality even when printing long-run jobs. Compared to solvent processing, drying time is greatly reduced, productivity is increased, and there is a reduced impact on the environment. The innovative water wash system eliminates the need for solvents, wicking cloths, and thermal equipment. 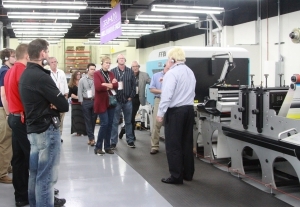 In addition to learning more about packaging technology, attendees also saw many other innovations, including the Acuity Series; the J Press line-up; the Inca Onset and Xerox presses housed within Fujifilm’s over 20,000 square foot facility.